Native to subtropical and tropical lowlands, the mango tree originated in India about 4,000 years ago, according to a University of Florida Institute of Food and Agricultural Sciences Extension website article. Gradually, the tree was distributed throughout the world in the 16th century. It wasn’t until the 18th century that the tree's cultivation began in the Americas. The bulk of mango varieties fall under the Indian type. 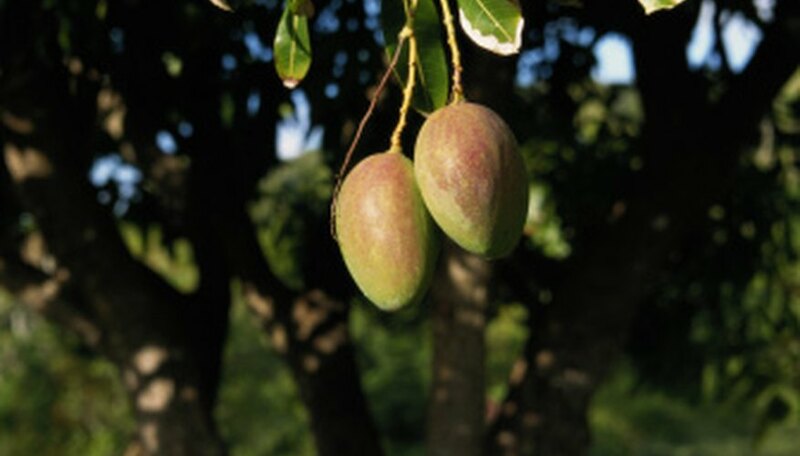 Traits of Indian mango trees include monoembryonic seeds with highly colored fruit. Monoembryonic seeds produce only one seedling per seed. Many varieties of mango trees fall within the Indian classification, including alphonso, kesar, rajapuri and ratnagiri. When ripe, the fruit of some of these varieties appears deep red and gold, while the ripe fruit of others remains green. Although all of these mangoes possess different flavors, only two classes of mangoes apply: high fiber and low fiber. Generally, the high-fiber varieties are used for juice and the low-fiber varieties for consumption. Some mango varieties originate from Thailand and the Philippines, and they are the Indochinese types. Those mangoes have polyembryonic seeds and fruit that is light green, yellow or green in color. The polyembryonic develop two or more seedlings from one seed. Indochinese mango trees include the Philippine, pim sen mun, okrung and nam doc mai. These varieties produce sweet, juicy fruit that is light green to yellow in color and generally low in fiber. More aromatic than the Indian types, Indochinese mangoes posses an aroma singular to varieties of this classification. The Kent variety of mango originated in Coconut Grove, Florida, in 1945. This variety bears fruit of up to 2 1/2 lbs. that matures in July or August. Trees can grow to 60 feet tall if not pruned. Also developed in Florida are the varieties Sprinfels and Valencia Pride. Both are considered vigorous plants with large fruits that ripen in July or August. The Springfels yields fruit of up to 3 lbs., while the Valencia Pride fruit usually tops out under 2 lbs. The Valencia Pride also is utilized as a shade tree in Florida.